Success in the kitchen is partially about having the right tools. When you’re looking a variety of meats, that can include a meat thermometer. Especially on a barbeque or smoker, a good meat thermometer can make a world of difference in your results. Keep in mind, hitting the right temperature isn’t only about flavor, it’s also a safety issue. 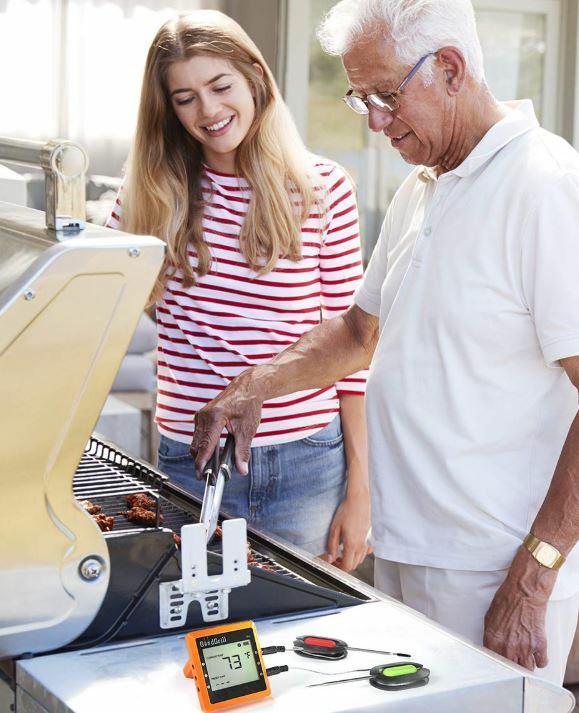 The idea of using a meat thermometer is nothing novel, but a great wireless grill thermometer can do more than measure temperatures. Great wireless monitors are made to require less of your attention. In other words, you don’t have to babysit your meat, which means greater freedom to use your attention elsewhere. Presets can be handy for anyone. If you’re not an experienced chef, or not experienced with the type of meat you’re preparing, having some guidelines can help keep your cook headed in the right direction. Even if you’re experienced, presets can save you the time of having to input temperatures yourself. But having presets doesn’t necessarily mean you are able change those presets. Experienced chefs may want to look for customizable preset levels. Is the display readable? How about readable in the dark or from a distance? Is it easy to install? Some meat thermometers will be designed to hang from the front of an oven. Some rest on a table, while others cling to magnetic surfaces. Which works best for you really depends on your unique circumstances. Do you want a temperature display unit you can view, or will a mobile app be enough? If there’s a mobile app, is it intuitive? Convenience comes from many different things. When one or two of these things are wrong, it’s only a minor inconvenience. When more than a couple problems crop up, it can be a deal breaker. If you’re involved in a smaller project, like cooking a single turkey, then you really only need two probes. One probe used to check baseline temperatures, and one prove shoved into the bird. But when you’re doing something a little more ambitious, you’re going to want more probes. 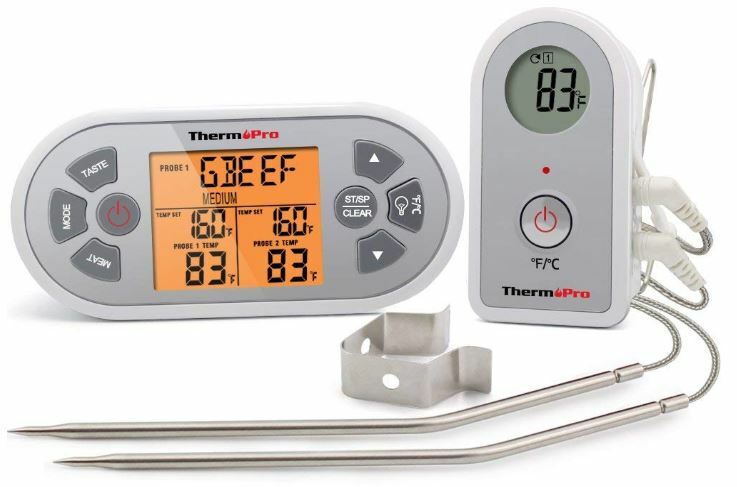 Most consumer grade meat thermometers will support between two and six ports for probes. Whether or not those probes are included is another question. 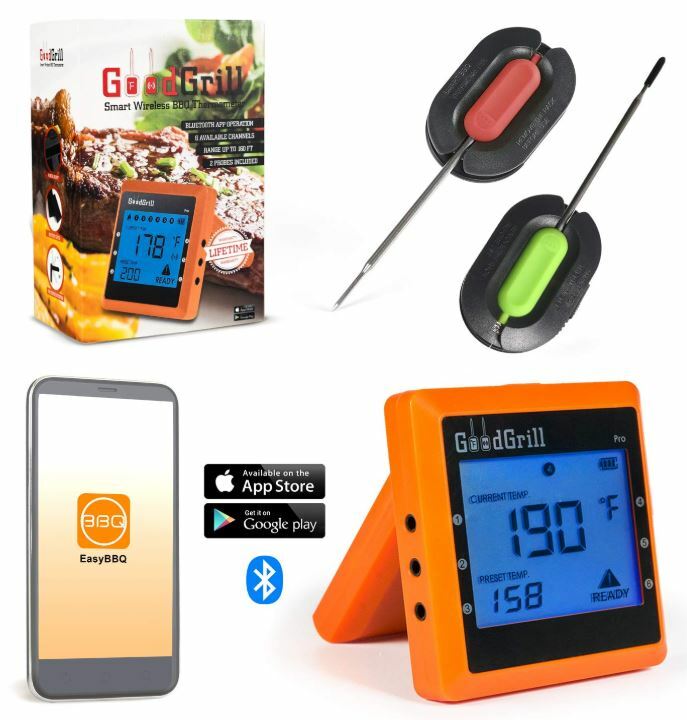 Most of the best wireless grill and meat thermometers for BBQ will include at least two probes, but some units may require you to purchase extra probes separately. The ThermoPro TP22 wasn’t made to be put inside a restaurant. But neither is it a particularly basic thermometer. It’s more like a unit intended for small scale cooking, but constructed with a full array of features. That makes it a good choice for someone who knows they’re not going to exceed the use of one or two probes, and someone who prefers to remain somewhat hands on with their cooking. Both the sensor and the thermometer measure roughly 1.5 x 3 x 0.4-inches. You hang the thermometer and its LED display on the front side of your oven, while probes run inside to take measurements at whatever locations you see fit. For instance, you might take a baseline measurement near the bottom of the oven, and then take a measurement in contact with the meat you’re cooking. The display remote looks similar to the thermometer, except it’s got nine function buttons and a much larger screen. The screen is also backlit in orange, which really helps it stand out. On the display, you’ll find everything necessary to keep a close eye on your thermal information. 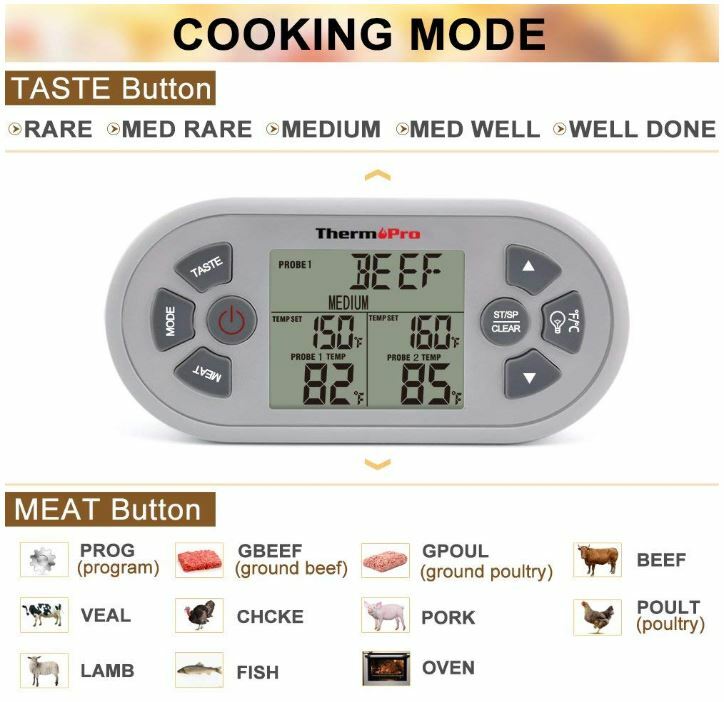 You’ll also find all the tools necessary to set appropriate timers for the meat you’re cooking. 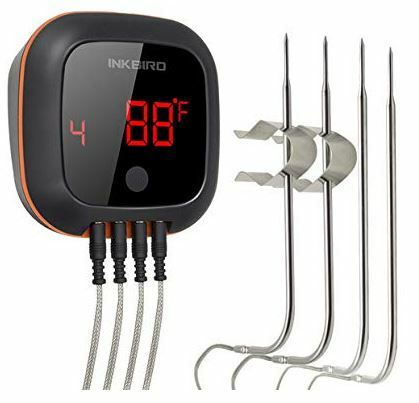 With a dual probe design, this device allows you to monitor several kinds of meat or temperatures simultaneously. And it includes nine different modes that can be used for meat presets. The doneness levels used by ThermoPro were actually defined along guidelines established by the USDA. The default program covers beef, veal, chicken, pork, poultry, lamb, fish, and a number of variations therein. You can also reprogram the preset temperatures to your own settings. That’s pretty handy because it means people who are amateurs and people who are experienced both have an equal measure of control over the TP22. Whether you’re a novice or a pro, your cooking stands to benefit. The maximum temperature the probe can withstand is about 572°F. The accuracy of your readings is within about 2°F, which is perfectly adequate for cooking meat. If you were trying to make certain types of candies, you might find that level of accuracy slightly inadequate. But given the meat-orientation of this device, it’s not an issue. 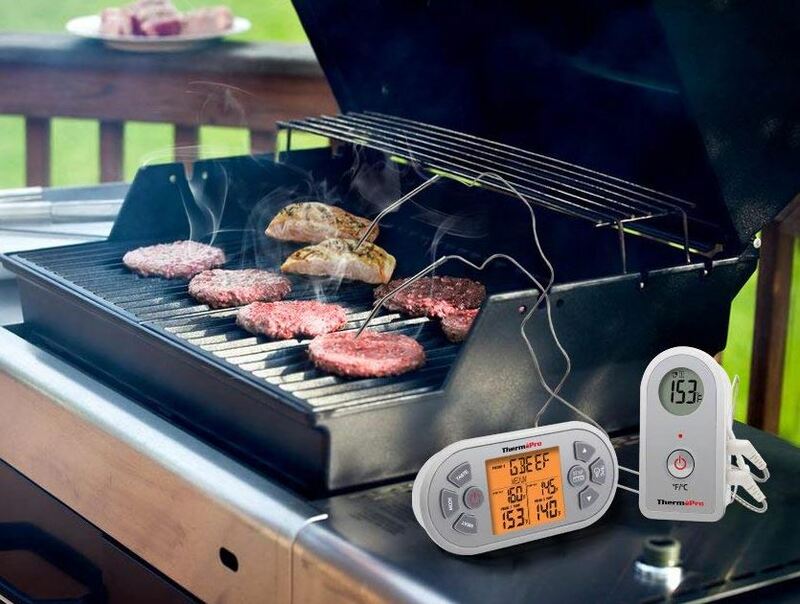 The BBQ portion of this thermometer also provides a number of handy features that can countdown or count-up, which can be great for longer grill sessions. When you’re trying to slow-roast a turkey, for instance. To help you get started on time, the receiver will start beeping when desired temperatures are reached. This kit includes a receiver, transmitter, probe clip, four AAA batteries, and a pair of temperature probes. It also includes a user manual, and a one-year warranty. If you actually take the time to register your cooker with ThermoPro, they’ll give you a free upgrade to a three-year warranty. 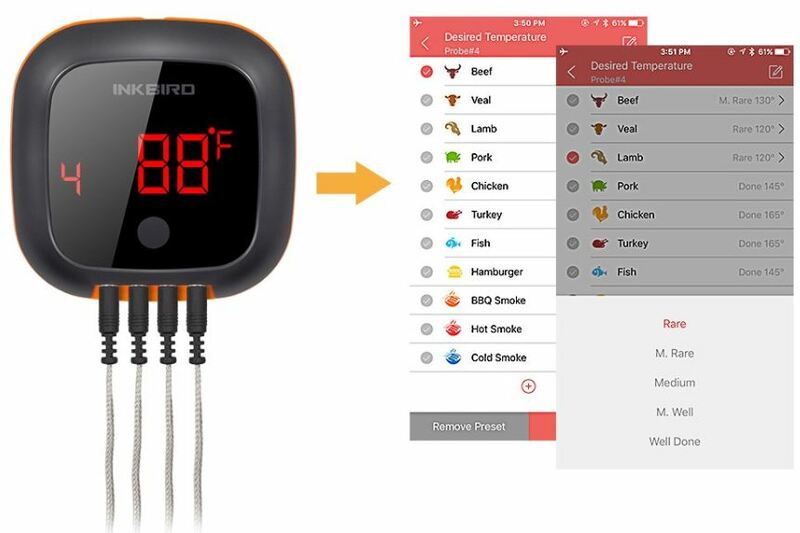 The Inkbird IBT-4XS is a Bluetooth based wireless meat grill thermometer. It connects using Bluetooth 4.0, which allows for support across both iOS and Android. 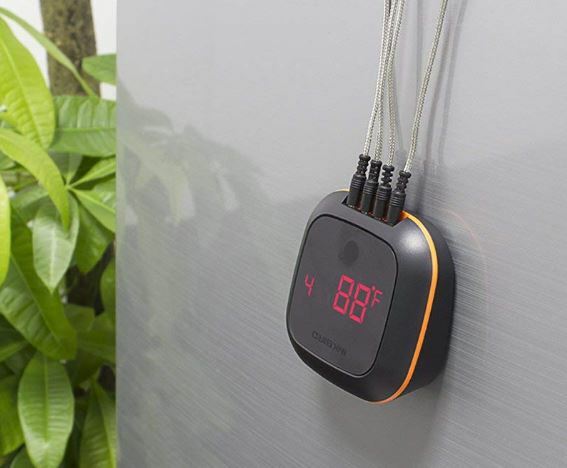 Anywhere you’ve got a smartphone or tablet, you’ll be able to connect with your thermometer. At least, anywhere within a 150 ft radius. The IBT-4XS has a modest emphasis on temperature accuracy, but its temperature range is actually slightly constricted. It runs from freezing to 572°F. For continuous monitoring, you’re actually restricted to 482°F because running higher than that, the probes will become inaccurate. And the IBT-4XS actually has both a two-probe and four-probe option, which is pretty adaptable. The included probes run a total of five feet in length. Getting the model with two extra probes only costs another $15 or so, but that’s $15 you can save if you only need one pair. The front display measures roughly 2.2 x 2.2 x 0.3-inches, and provides you with a three-digit readout of the current temperature, as well as an indication about the status of the battery. The display is large enough for a clear read from about 30-feet away. Though that does depend on the quality of your vision, and various environmental conditions. A little fog would complicate things. While some thermometers are based on AA batteries, this device was constructed with a 1000mAh rechargeable lithium-ion battery. It doesn’t sound like much, but that’s actually quite large relative to the small amount of power output for the tasks it’s expected to perform. With respect to reading data, you’ve got a couple of strong options. Though the default is Fahrenheit, the IBT-4XS is capable of being switched to Centigrade. Apart from the display, you can view your data with the help of the included app. Though the app is somewhat basic in form, it does include a graphing function. You can also monitor its battery through the app. All in all, it provides about 60 hours of total charge time. But depending on its placement, you may end up with closer to 45 hours of battery capacity. That’s not bad. Moreover, you can create preset alarms for high and low temperatures. But beyond that, there’s really not much in the way of alerts you can create. 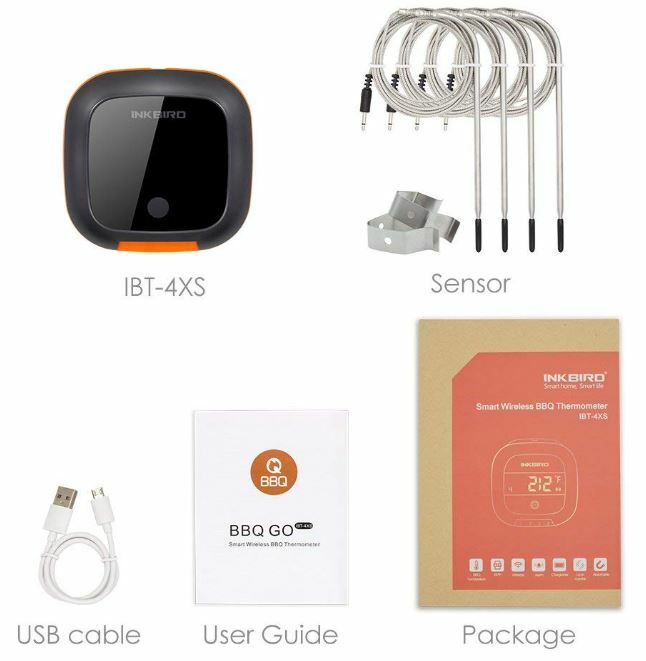 Apart from the sensor probes, the IBT-4XS Bluetooth Thermometer includes a user guide, and micro USB charging cable for charging. Inkbird also includes a one-year warranty. The GoodGrill Wireless Meat System is more than a thermometer. You can see the difference in the details. For instance, the app was made streamlined with some features that are friendly towards less experienced chefs. You can choose between a variety of presets designed for pork, lamb, beef, fish, chicken, BBQ smoke, and so forth. The presets can even be adjusted. Nevertheless, setting up the GoodGrill Wireless Meat Thermometer System is tremendously straightforward. With the assistance of a magnetic backing, installing the thermometer against a metal surface takes about two seconds. Getting involved with the support app takes little more. 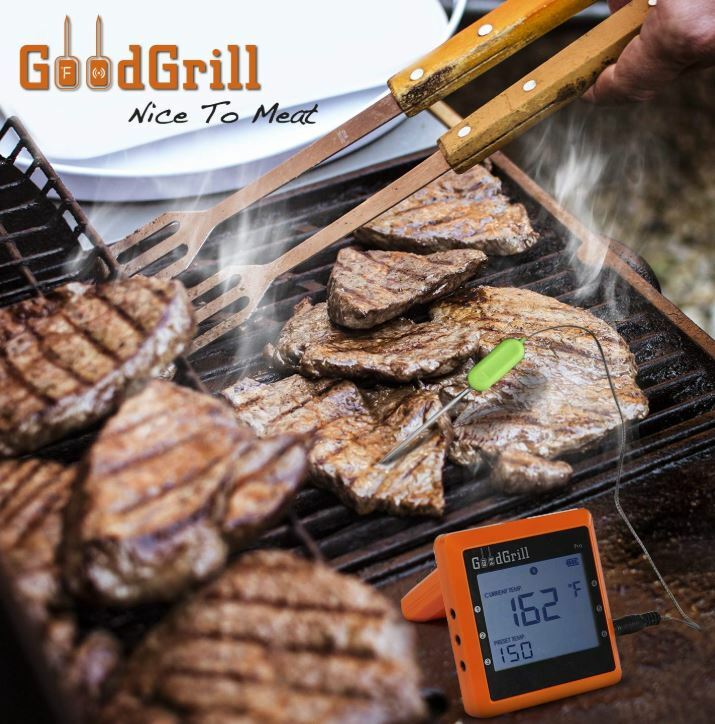 The GoodGrill Wireless Meat System’s thermometer measures roughly 3 x 3 x 0.5-inches, with the entirety of the front being taken by a large backlit LCD. Its bright orange chassis is made from ABS plastic. Its finish is fairly glossy and attractive, though it does pickup glare in direct sunlight. The display is propped up by a kickstand which emerges from the backside of the device, which can be moved in a full 180-degree radius. Whether you want the display flat on the table facing upwards, or you want it sitting at a 90-degree angle like a television, the stand can accommodate you. The stand is also where GoodGrill decided to place the batteries. You need two AA batteries, which are included. This so-called meat system can support as many as six probes. The standard unit only contains two probes, but extra probes can be purchased from GoodGrill. The probes are actually stainless steel, which ensures they won’t get harmed by contact with oils and heated liquids. Each probe runs about four feet in length. When you shove them inside meat, they’re thin enough that they barely do any amount of damage. Certainly none that is visibly obvious. The maximum range you’ll want to put between the thermometer and your mobile devices is about 160 ft. That’s assuming there aren’t any big obstacles between yourself and the thermometer. When you add a large wall, gate, truck, or something similar, then you’ll find the connectivity drop off pretty rapidly. Basically the same as any other Bluetooth connection. There’s a battery level indicator on the topside of the unit, but you should be able to expect several months of life without having to concern yourself with replacing the batteries. You’re also able to review the current battery from the control app, which can give you alerts and notifications as needed. Like with the ThermoPro TP22, the temperature presets included with the GoodGrill Wireless Meat System are based on guidelines from the USDA. That makes this system pretty accessible for people who are picking up a thermometer because they’re not certain how long something should be cooked. The Good Grill Meat System doesn’t include a bunch of extras, but in addition to the probes, it does include a lifetime warranty. The ThermoPro TP22 has an impressive 300-foot range, which really helps define the device. It can only support two temperature probes, but that’s all most home chefs need, isn’t it? Whether you’re a skilled and experienced chef or you’re a novice, the included presets are quite handy. Which makes the TP22 a good choice for someone who needs to keep a close eye on their meat, but doesn’t need anything too fancy for the job. The Inkbird IBT-4XS can run either two probes or four probes, but it only has half the wireless connection distance of the TP22. Its display smoothly cycles through each probe, which makes using this thermometer with multiple probes an equally smooth experience. Additionally, the battery life is long enough for lengthier cooking sessions, which makes the IBT-4XS a great choice for someone who needs more than a basic meat thermometer. 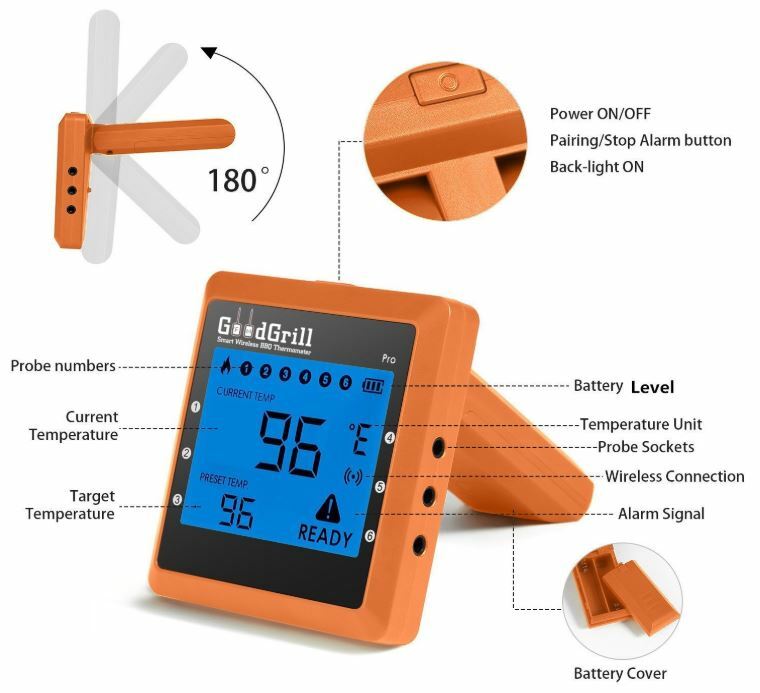 The GoodGrill Wireless Meat Thermometer System is much, much more than a simple thermometer. You’re able to run as many as six independent temperature probes to this device. It has all the presets you’ll find with the TP22, and with much better expandability options. That makes the GoodGrill Wireless Meat System a good choice for someone who needs something more comprehensive. This is a great device and concept. 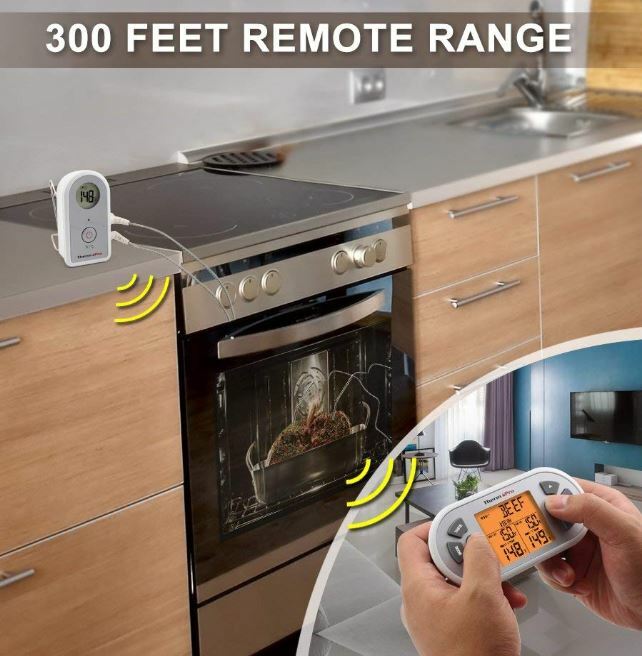 Does there exist a bluetooth device like this for the stove? I am looking for one to measure the inside temperature of a vehicle is there one that can remotely measure air temperature.